An inquest to ascertain the cause of death was promptly held the next day at the Albion Hotel. This building stood on Sherwin Road until the 1960s when it was pulled down to be replaced by the 17th/21st Lancers public house. After hearing the various witnesses, the 18-man jury soon decided that Caroline Woodhead had been murdered by this John Brooks. One of their more macabre duties had been to inspect the corpse. This, it appeared, was to satisfy the jurymen that her death could not possibly have been the result of natural causes. A crowd of several thousands had gathered around the Albion Hotel and some had ever pushed their way into the building and thronged the passages and rooms below where the inquest was being held. All, it seemed, hoped to catch a glimpse of the murderer and some the chance to view the corpse, Six weeks later, on January 28th 1878, Brooks was brought to trial at Lincoln Assizes. The jury there was equally convinced of his guilt and brought in their verdict after only fifteen minutes deliberation. The outcome was that Brooks was sentenced to death. But what had led him to commit this dreadful murder? Three years earlier, Brooks, a native of Radford and employed at Gadd's lace factory on the Forest, had left his wife to live with Caroline Woodhead, who had also left behind a husband. They went together to France and there Brooks obtained work in a Calais lace factory. After a little over a year they returned to this country and set up home first in Manchester and then in Lincoln. Caroline's mother had always been unhappy at her daughter's liaison with Brooks and constantly encouraged her to leave him and return to the parental home on Mills' Lane. When Brooks was no longer able to support them both after he lost his job owing to an injury to his leg, Caroline decided to take her mother's advice, end the relationship and return to Lenton. This she did. A week later, Brooks followed her to Nottingham. For two weeks he tried to see Caroline and persuade her to live with him again. Caroline refused and her mother kept turning Brooks away from their door whenever he came to plead his cause. site which now houses the Palais de Danse (photograph courtesy of the Local Studies Library). Brooks began to drink heavily. A certain William Godfrey testified that he had met Brooks in a pub on the Friday before the murder and Brooks had talked about his desire to kill Caroline Woodhead and had debated whether it was better to cut her throat or to strangle her. Godfrey had assumed it was merely 'the drink speaking' and had not mentioned it to anyone. When Brooks later urged people to understand that the murder had not been premeditated, many simply remembered Godfrey's evidence. Brooks claimed in his death cell testament that the murder 'had arisen out of my disordered state of mind, the outcome of drink and trouble', that 'C.W. had agreed to meet me' and that when he had told her he was going to kill himself, she had said 'No, kill me first'. So in his confused state of mind, he did, fully intending to kill himself straight after. But the dreadful deed done, he had fainted away, and on coming round, he claimed he had been unable to find the cutthroat razor. So it was in a crazed state of mind he had run into P.C. Wilkinson. 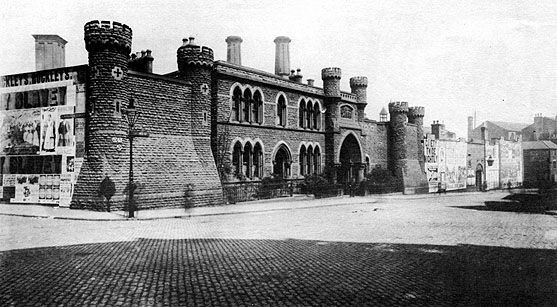 His execution took place within the Town Gaol on February 13th 1878. This was the first execution there under the Act of Parliament of 1868, which had finally put an end to public hangings. The hangman on this occasion was William Marwood of Horncastle. John Brooks was 32, Caroline Woodhead a mere 23 years old. (*) Allenfield Gardens were allotments with the odd dwelling dotted in among them on the hillside between The Park and New Lenton. They disappeared when the area was developed as 'the Drives'. The present day Rolleston Drive follows approximately the line of Mills' Lane.